Joel A. Barker is one of the best-known futurists in the world. His videos on the future have been translated into 20 languages and have been seen by more than 100 million people. His book on paradigms is a standard text in more than 100 universities and has been translated into 20 languages, the most recent, Russian. 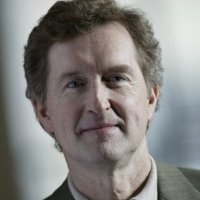 He popularized the concept of paradigm shifts in the 1970’s and started the corporate discussion of the importance of vision in the late 1980’s with his video, “The Power of Vision.” Industry Week Magazine has referred to his videos as one of the most influential series of programs in the business world. His most recent focus is on “innovation at the verge”—a new place for finding the big ideas for the 21st century. He is coupling that work with new tools for identifying the long-term implications of change. Formerly Director of the Futures Studies Department of the Science Museum of Minnesota from 1975 to 1978, he has since spoken to more than one million people in North America, Europe, Asia and South America and Australia. He has received numerous awards including two honorary doctorates. In 2008, he was identified as one of the top 100 thought leaders in personal leadership and organizational Leadership by Executive Excellence Publications. And his alma mater, the University of Minnesota, identified him as one of the 100 most influential graduates from the College of Education in the last 100 years.